Coconut Fruit Tart is a nice slice to wake up my taste buds and change up my breakfast groove. Less sugar and more protein and fiber is just dessert! While the oven is heating, toast ¼ cup coconut for topping. 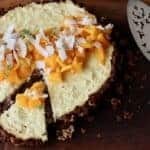 Spread coconut in a single layer on baking sheet. Bake for 5-7 minutes, until lightly browned, stirring frequently. Coconut is high in fat, so it can easily burn. In a large bowl, combine bran flakes, butter or coconut oil, walnuts and ginger. Press firmly into a 9-inch tart or pie pan. Bake 12- 15 minutes. Set aside to cool. In a bowl, stir eggs to mix well, add yogurt, coconut, honey and vanilla extract. Stir to combine all ingredients. Pour into cooled crust. Bake at 375°F for 25-30 minutes, until filling is set. The center of the tart should be firm and not jiggle if you shake the pan. Remove from oven to cool. Tart may be refrigerated overnight. Before serving, top with chopped fruit and sprinkle toasted coconut and lime zest over. Use your favorite fruit. Frozen works too! To 2 cups frozen mixed berries, add 1 tablespoon honey and 1 tablespoon frozen orange juice concentrate. Let thaw, stirring occasionally.